Press Release (ePRNews.com) - BURGESS HILL, England - May 18, 2017 - IXYS UK Westcode have today launched the highest genuine current rating press-pack IGBT available on the market which is set to break new ground in power handling capacity of a single device. The new symmetric blocking device with a continuous DC rating of 2.8Kv has a record breaking DC current of 6000A. The new device has been supported by IXYS UK’s extensive experience in manufacturing and understanding the principles of very large press-pack IGBTs with multiple parallel die. The new 4.5Kv devices incorporate proven SPT plus die technology and are constructed using 52 parallel connected IGBT die, 10 more than the largest established part with a current rating of 2400A at the same 4.5Kv blocking voltage. Each die is 14.3mm square with an active area of approximately one centimetre squared. 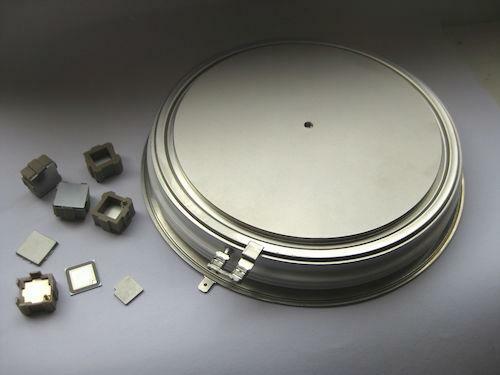 The new device encapsulated in fully hermetic 26mm thick with a 132mm electrode diameter, larger than the established 2400A device, but maintain the same 170mm overall diameter as the 42 die design; this gives an effective 25% more current rating in the same package. The robust internal construction is bond free with the individual die directly pressure contacted through metallic pressure plates to the external copper electrodes. The direct bond free contact ensures highest reliability and unrivalled thermal cycling properties, far exceeding those of a conventionally packaged plastic package module. The package design is based on IXYS UK’s proven technology, with the same advantages of enhanced rupture capability, resisting more than ten times the short circuit energy of a conventional plastic packaged module device and the additional advantage that the device is virtually guaranteed to fail to a stable short circuit. These unique properties make the new device an ideal solution where high reliability, maximum power density and predictable failure are important. In particular, the short circuit failure mode makes these devices the obvious choice for applications requiring series operation, such is the case in utilities, HVDC and very large medium voltage drives. The unrivalled current rating can also reduce the number of parallel paths required in very high current applications in the multi megawatts range. Generally, these devices are well suited to harsh environments and where maintenance access is difficult such as off-shore marine and wind. The hermetic structure and high rupture resistance are properties which are particularly relevant in harsh environments where explosive failure and plasma leak are unacceptable, such as mining, gas and oil instillations. In order to facilitate the application of this new higher rated press-pack IGBT, IXYS UK Westcode has also launched a new complementary diode in its range of very high di/dt HP Sonic FRDs. This new diode is constructed using a new die bonding technology to maximise reliability. Packaged in an 85mm electrode 26mm thick package the diode is pressure compatible with the press-pack IGBT so it can be mounted in the same series string for compact three level inverter configurations. Part number designations for this reverse conduction press-pack IGBTs is T2960BB45E & the compatible HP Sonic FRD is part number E3000TC45E. Typical applications for these devices include: utilities and HVDC applications such as, flexible AC transition systems, HVDC transition, Statcoms, VSC SVC etc; medium voltage AC drives for harsh environments and ultra-high power, such as mining, marine and off shore g, gas and oil installations; renewable energy for wind turbines, hydro generation, wave generation and solar; plus, any application where high power density and reliability is required. GD Rectifiers is a European Distributor for IXYS UK Westcode and IXYS Corporation, they have been working in partnership with one another for over 20 years. GD Rectifiers are a trusted distributor of IXYS UK Westcode Thyristors, Air Cooled Heat Sinks, Solid Fin Heat Sinks, Diodes, Distributed Gate Thyristors, Fast Turn-off Thyristors, IGBTs, GTO Thyristors, Medium Voltage Thyristors, AC Capacitors, DC Capacitors and Power Assemblies. For further information on GD Rectifiers full IXYS UK Westcode product range or to discuss IXYS UK’s new 4.5kV press-pack IGBT please call: 01444 243 452 or email: enquiries@gdrectifiers.co.uk (mailto:enquiries@gdrectifiers.co.uk). Exostiv Labs appoints E-Elements Technology for sales and technical support in Taiwan and China.